I found one reference online for Myrtle H. Gilkeson. Her name appears in 1903's "Hand-book of the First Presbyterian Church" of Staunton, Virginia. She is listed as being from Tinkling Spring. And she received a certificate for reciting perfectly the shorter catechism. By the time this copy of "Elsie Dinsmore" got to me, it was falling apart and unsalvageable. In addition to this Christmas gift inscription, there were other signs that the book's provenance changed over the years. 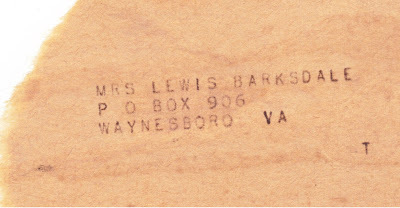 An inside page featured a mailing label for W.H. Wade of Raphine, Virginia. The tattered book came in an envelope that was addressed to Mrs. Lewis Barksdale of Waynesboro, Virginia.